Everybody has something special that makes them feel brave when they are scared. Or that’s what Millie’s friends tell her. Don stomps, Gus roars and Lea flies and swoops. 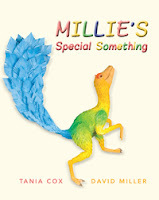 But Millie is too small to stomp and roar, and her feathers aren’t meant for flying. So what is Millie’s special something when big bad Reggie comes along? Tania Cox has written a delightful story about a small dinosaur that discovers, with the help of her friends, what her special something is. The text is full of action and a lovely use of language and noises makes this a great book to be read out loud. The vibrant paper sculptures by David Miller add an extra depth to the story. Intricate and detailed, they manage to create texture and movement on the page. Tania Cox and David Miller also worked on Snap! Went Chester, shortlisted for the 2003 CBCA. This picture book is ideal for pre-schoolers but as it also touches on the topics of self-esteem, fear and bullying, it would also be suitable for lower primary readers.